Instant Cash Club Scam Review - Don't Be The Next Victim! Just 2 days ago, I received emails from 3 of my readers alerting me of Instant Cash Club scam. Every single one of them lost a couple hundreds of dollars to the trading software, so don’t be the next victim. If you haven’t funded your trading account, take a few minutes and read through this Instant Cash Club review. It’ll save you at least $250. It’s actually pretty easy to recognize an online scam. If it sounds too good to be true, it is probably a fraud. Obviously, this applies to Instant Cash Club, too. At soon as you are introduced to their website, the presenter, Jim Robinson promises to make you over $10,000 a day as long as you sign up for the free software. There’s no experience needed, all you need to do is to let the software trade automatically and collect your huge profits. Needless to say, everyone would be millionaires by now if such technology exists. Instant Cash Club scam actually belongs to a much larger fraud category known as the binary trading software scams. I’ve reviewed more than 100 of them, and none of them worked. 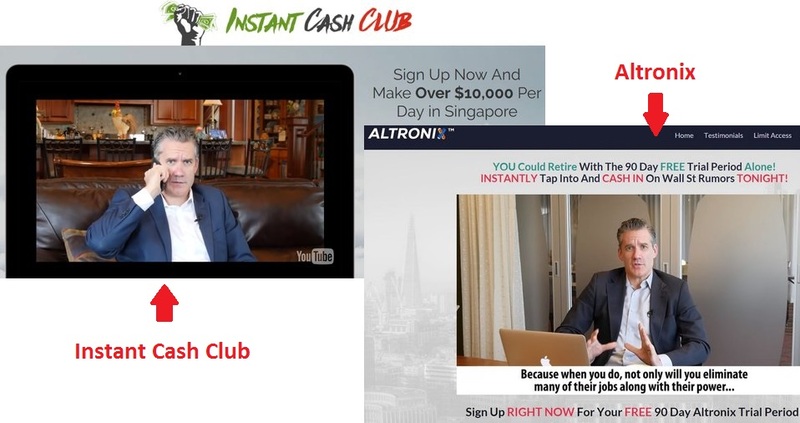 After conducting some background check on the presenter of Instant Cash Club, I realized that the same guy was featured in Altronix, another binary trading software fraud. He identifies himself as “Jim Robinson” in Instant Cash Club, but introduces himself as “Frank Saunders” in Altronix scam. Hiring actors and actresses is not new to online scams. Many other scams are using similar tactic to confuse the victims, such as Dubai Lifestyle App and Binary Trust Method that I have reviewed earlier. Below the sales video, we can find several member profiles that are complete with profile picture, name and profits achieved (screenshot above). As usual, I did a reverse lookup based on the profile pictures to verify their identities. Turns out none of the profiles were real. Take “Kathy P.” as an example, where she is said to have achieved $1,244,660 using Instant Cash Club system. The original photo was taken from Patricia Weitz, a writer most renowned for her book “College Girl”. Apparently, the scammers behind Instant Cash Club found random photos from the internet and fabricated fake identities for them. This is yet another marketing tactic used by many scams to boost their credibility. In fact, none of the real members who used the software made money. Just like my readers who fell prey to the scam, every single one of their users made huge losses with the software. If you have traded binary options before, you would know that the market is closed for trading during the weekends. In other words, you can’t trade on Saturdays and Sundays. This review was written on a Saturday (1 Oct 2016), and I realized that the “live profits” table of Instant Cash Club website was still updating their real-time profits. How is this possible? Apparently, the live profits table was just a computer-generated script that pairs your computer’s date to random assets and profits. There’s no real trades and profits behind all those numbers! Once my computer’s date is changed to 1986, the dates on the table changes accordingly. This proves that the results are not real-time, instead it is just another tool used by the scammers to fool victims into thinking that the software works. As much as Instant Cash Club scam wants to keep you in the dark, they have to reveal the true nature of the scam somewhere in the website to protect themselves from lawsuits. The chose to hide the truth deep within the disclaimer, where most victims wouldn’t even read it. You can’t find this document anywhere in the sales material, because it is supposed to be hidden from you. The only place you can access it is through a fine print at the bottom of the sales page that reads “disclaimer”, in which almost no one will notice. You can verify the authenticity of the terms above by comparing against the original disclaimer at instantcashclub.co/disclaimer. 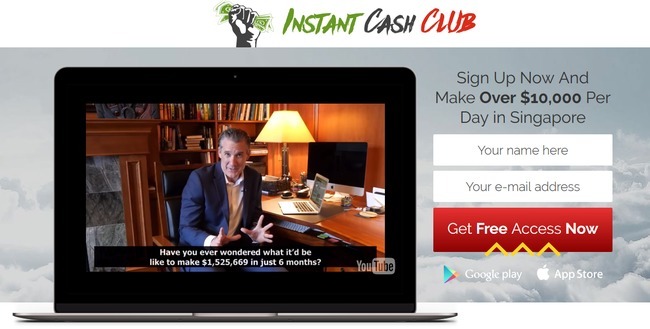 Despite coercing you to sign up for the “free” money-making software, Instant Cash Club denies inviting you to trade binary options. Note: Frauds that promise unrealistic returns like Instant Cash Club are illegal in many jurisdiction. If they do not include this clause, they are deemed to illegally coerce you into signing up for the scam. 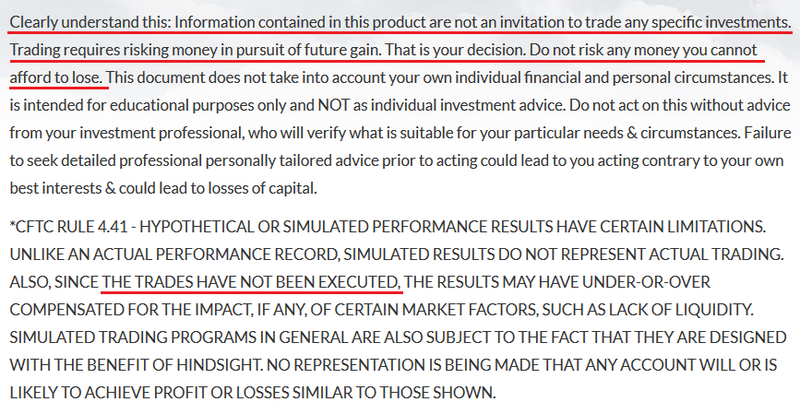 Instant Cash Club admits that trading binary options is extremely risky, and it’s your own responsibility if you decide to sign up and lose all your investments. NO REAL TRADES HAVE BEEN EXECUTED using Instant Cash Club software. All profits quoted in the sales material are fake. What about the profits Jim Robinson showed you in the sales materials? Of course, they are just fake profits used to entice you into signing up for the scam. If you decide to sign up for Instant Cash Club app, you will be required to open a new broker account with their partner brokers, which are unregulated by monetary authorities. The losses are pocketed by the broker, which is then shared with its partner-in-crime – the scammers behind Instant Cash Club system. INSTANT CASH CLUB IS A SCAM. I strongly advise you to stay away from the scam if you don’t want to lose your hard-earned money. I really hope I read this review earlier! I’ve lost $150 in just 1 day! Never gonna sign up to this kind of scams again! Hi Nicholas, unfortunately the lost funds cannot be recovered. Just take it as a lesson like I did and move on. Most importantly, stay vigilant and be extra careful when you come across opportunities that seem too good to be true in the future.